Back by popular demand, Elvis Presley tribute artist Doug Weich marks his 7th consecutive year at the upgraded Rhumbelow Theatre with his new show Viva Las Vegas. 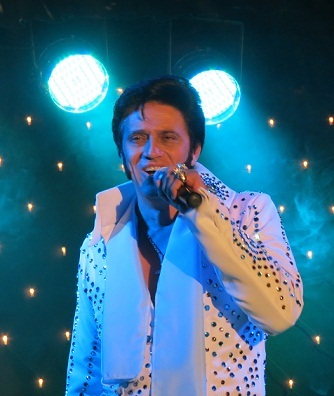 The show takes audiences on a journey of what it was like on the Vegas Strip when Elvis Presley was headlining at the International Hotel, when he made his return to live performances with his iconic gem studded jumpsuits, starting from his debut in 1969 up until his last performance in 1977. The show also gives a glimpse of what other iconic performers such as Cher, Tina Turner, Frank Sinatra, Dolly Parton, Elton John and Diana Ross were entertaining in Vegas over the same period. Viva Las Vegas is a show with all the glitz and glamour and is packed with timeless classic hits of yesteryear such as Blue Suede Shoes, Hound Dog, Jailhouse Rock, Heartbreak Hotel, Johnny B Goode, Suspicious Minds, New York New York, Chain Reaction, Proud Mary, just to name a few, that will keep the audience thoroughly entertained for the full 90min performance. A Rocktainment Production, Weich is backed by his well accomplished, multi-talented eight-piece band, MSG, comprising Wade Wight (keyboards / male backing vocals); Evan Cullum (piano / male backing vocals); Glen Turrell (bass guitar); Alec Mackay (drums); David Knott (lead guitar), and Kirsty Van Der Linde (saxophone) with Claire Rowlette and Sandi Da Cunha on female vocals. Las Vegas runs from August 3 to 12, 2018 with shows on Fridays and Saturdays at 20h00 and on Sundays at 14h00. The venue opens 90 minutes before show for picnic dinner. Tickets R150 (R130 pensioners - 1st weekend ONLY - and tables of eight or more).